Well I won’t be racing the Casablanca 8km tomorrow because my foot is still bothering me. I went to the Chiropodist (I didn’t even know that word existed) yesterday and I was told I have capsulitis of the second toe. If you’re having foot problems I suggest going to see Dr. Marando at the Niagara Foot Care Clinic in Grimsby. My plan is to hit up the X-training and let this thing heal in the hopes of running Nats XC. My main priority is to be ready for a Spring marathon and be 100% for training in January when the build-up begins. Speaking of January, my trip to Kenya has been pushed back one week. It turns out the Cinque Mulini race in Italy is this year’s European Club Cross Champs and there is no race for non-Europeans. I had read that this year’s race was going to be the ECCC but I didn’t realize they were cutting out the international elite race. The new plan is to race in Hannuit, Belgium on February 13th. As much as I was looking forward to racing through barns (windmills) I’m happy to be going back to Belgium. 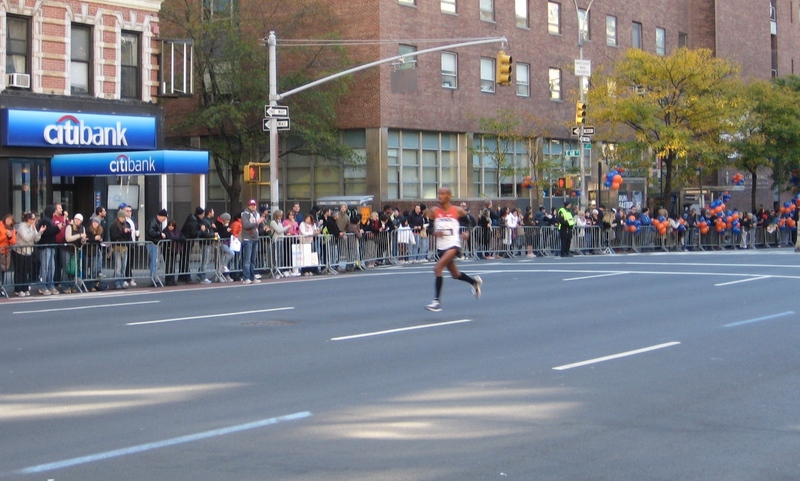 A lot of people asked me what happened to Simon in NYC but I never saw him after the race. I did get a chance to see him the day before the race. I also saw him just after mile 17 and he was looking pretty good. Apparently a few miles later he ran into fueling issues and hit the “wall” and ended up in an ambulance. It sounds like he didn’t really need the ambulance, just needed some food, article here. Bairu on 1st Ave, just past 17 miles. CIS XC Champs in Sherbrooke this weekend. Let’s GO GRYPHONS!! 100 plus miles a week likely doesn’t help. You’re right, especially when I hit 110 miles in NYC (mainly asphalt). I first aggrevated it a few weeks ago during a run when I stepped on a stone in the wrong spot. My second toe is longer than my first so that, along with the combination of mileage is not letting it heal. This is my third day x-training and I already feel it getting better. Dr. Marando in Grimsby is indeed an outstanding resource of foot health information.